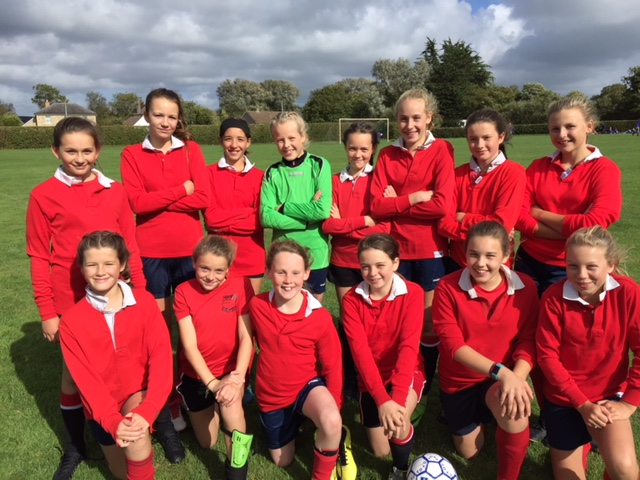 On a very cold and wet day the U13 girls kicked off the ESFA Nationals with a home match against Priory School from Weston Super Mare. The strong wind was always going to be very challenging for both teams but Hugh Sexey's were great, and played smart football - short passing and keeping the ball on the ground. The first half finished 0-0 with both sides coming close to scoring, but both keepers were on good form. In the second half Hugh Sexey's rang some changes and introduced 3 fresh players into the game: Radford, Kennedy, and Fuller whom came on and made an instant impact. Within a few minutes Thurling found her goal scoring touch and bagged four goals in the half. A screamer from Pargeter into the top corner of the net gave us a fifth goal. Priory scored a late penalty from the spot after a handball. The final score was 5:1 to HSMS. Many thanks to Priory for a lovely game of football. It was a pleasure to referee this game and to see the girls' great attitude on the pitch. Hugh Sexeys are now through to round 2, and believe we next play Gordano at Home; date to be confirmed.